This post follows up a discussion earlier this week which introduced the notion of the gasoline (expenditure) intensity of the economy. A reader (Thanks RC!) 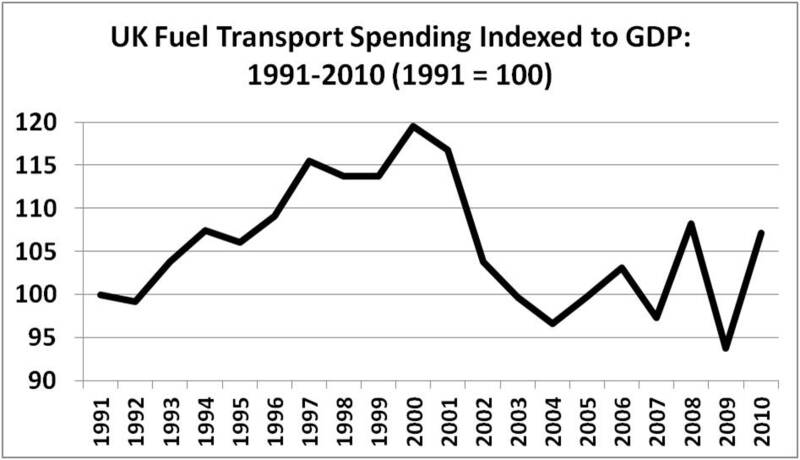 observed that the UK has seen a dramatic shift away from gasoline to diesel fuel for transport. So I have recalculated the index (shown above) to include both gasoline and diesel (data sources are the same). Assuming UK petrol consumption is constant in 2011 and 2012, and GDP in 2012 = 2011, then the index above increases to 120 in 2011, or about the same as it was in 2000. 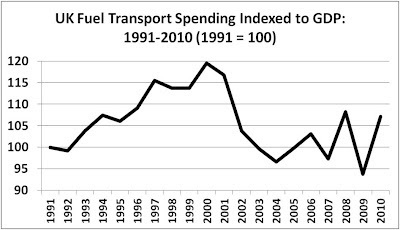 Thus, since 2001 US spending on gasoline as a proportion of GDP has increase by about 30%, while UK spending is about the same level or a little less. So the bottom line for the US in comparison to the UK is mixed -- The US spends about 20% as much of GDP on gasoline than does the UK. At the same time, over the past decade US gasoline intensity has increased by about 30% while UK gasoline intensity is about the same as it was 10 years ago. I am also following up on trying to get global data on energy and petroleum intensity of GDP, as discussed here (thanks to those who have emailed, but no hard data yet! ).